Modernised strategic bombers will boost Russia’s military power, Vladimir Putin has said. 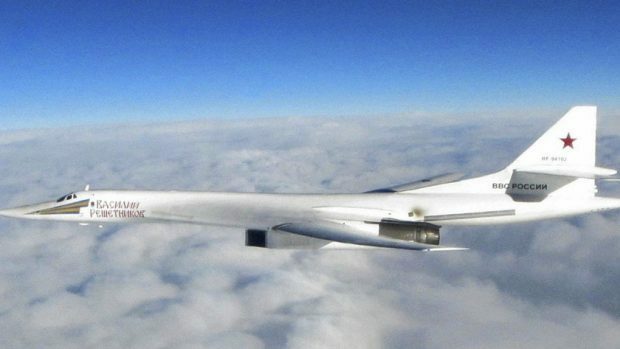 Speaking on a visit to an aircraft-making plant in Kazan, the Russian president said the revamped version of the Soviet-designed Tu-160 bomber features new engines and avionics that would significantly enhance its capability. The Russian leader attended the signing of a 2.9 billion US dollar contract that will see the delivery of 10 such planes to the Russian air force. He said the upgraded bomber is a “serious step in the development of high-tech industries and strengthening the nation’s defense capabilities”. The four-engine supersonic bomber developed in the 1980s is the largest combat plane in the world. During Russia’s campaign in Syria, the military used the Tu-160s to launch log-range cruise missiles at militant targets. Mr Putin also suggested that the plant develop a supersonic passenger jet based on the Tu-160, saying Russia’s vast territory would warrant such a design. The state-controlled United Aircraft Corp said in a statement carried by Tass news agency that preliminary work has started on designing such a plane. The Soviet-designed Tu-144 supersonic passenger jet that rivalled the British-French Concorde saw only a brief service with Aeroflot after Soviet officials decided it was too costly to operate. Concorde entered service in 1976 and operated for 27 years.